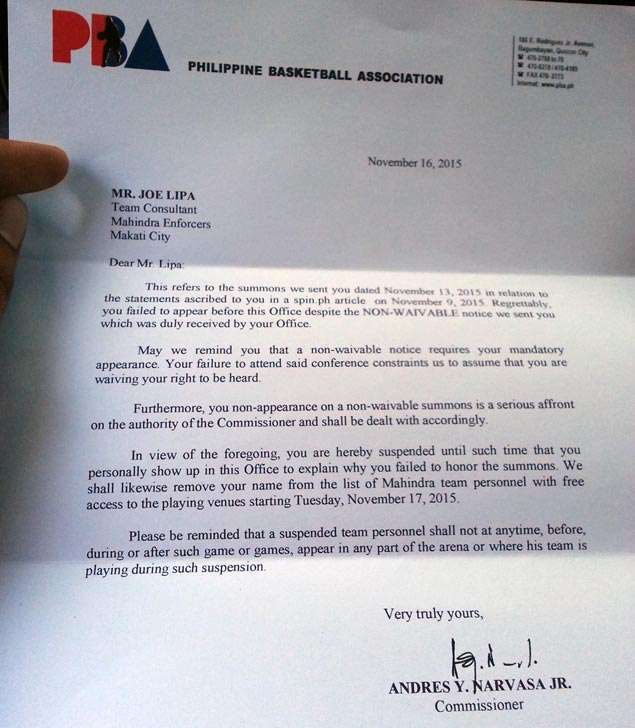 PBA commissioner Chito Narvasa has suspended Mahindra team consultant Joe Lipa for failing to honor a mandatory summon over statements the coaching legend gave to Spin.ph defending playing-coach Manny Pacquiao from 'degrading' remarks made by the league chief. “I was offended by his first letter. Masyadong strongly worded. 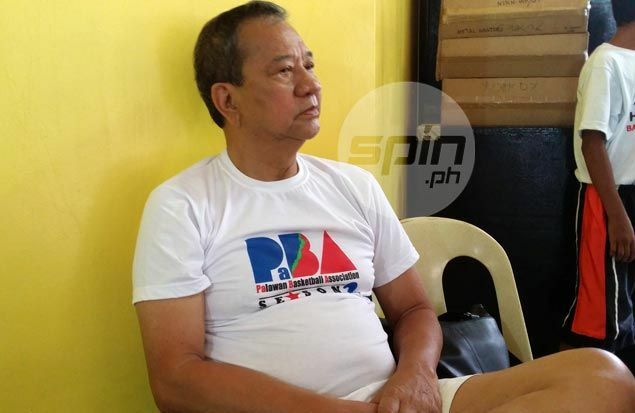 It appears that he is demanding me to come to his office ... there are better ways to draft a summon,” said Lipa, who led an all-amateur Philippine team to a bronze medal in the 1986 Asian Games in Seoul, and University of the Philippines to its only UAAP championship in 1986. “Talagang he was demanding me to come to his office and the letter was accusatory. He summoned me dahil sa mga sinabi ko sa inyo tungkol kay Manny Pacquiao,” he said. “I just said what I have to say. He undermined our playing coach, who is he to do that? I am the elder statesman of the team and it is my obligation to pick up the cudgels for our ballclub,” he said. “And even if it was not Pacquiao who he degraded, kahit 'yung pinakamaliit na player namin sa team o ballboy, I will also confront him because I know that is wrong. It is unbecoming of a commissioner. “Alam mo, he is undermining the ability and standing and the image of Manny Pacquiao as a coach and as a player, by saying he is not a basketball player but a boxer. Why did he say that? Dumaan sa draft nila si Manny ah. Inallow nila to participate, suddenly gaganunin nila,” he added. The fiery coach said he has drafted a letter to respond to Narvasa's summon but decided against sending it; Lipa said he prefers to say what he wants to say to the commissioner face to face. “Balak ko sanang isulat sa kanya lahat ng sagot ko pati yung mga sinabi ko sa inyo, pero plano ko sabihin na ito lahat sa mukha niya. May sulat ako na sinabi ko na I can discuss this to you, mano-a-mano (face to face),” said Lipa. “Hindi ko na isusulat." The iconic coach also has one piece of advice for Narvasa. “He should never approach people with him on a higher plane,” said Lipa.